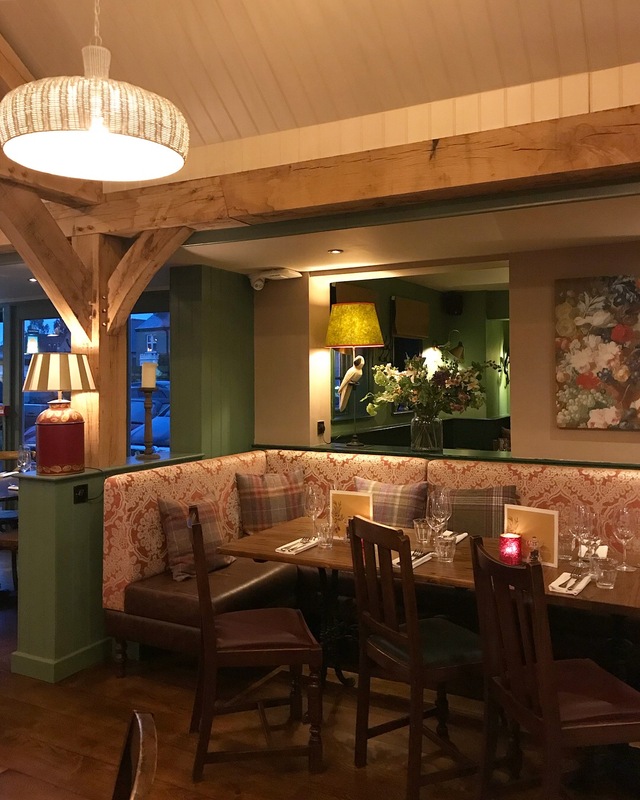 The menu is a combination of French brasserie favourites and British pub classics. I’m from Québec, the French part of Canada, and seeing escargots on the menu took me back to my childhood. It was bit odd to see the classic escargots à la Bourguignonne translated into “Burgundian snails” but I suppose the French is a bit of a mouthful. 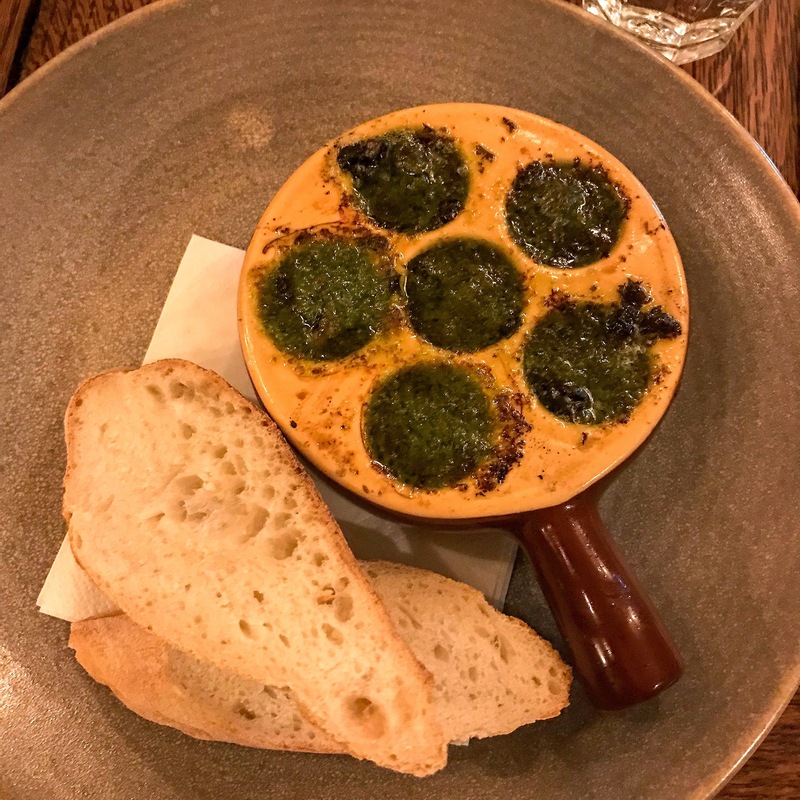 Speaking of which, when I popped the snails into my mouth they were delicate, not the least bit rubbery and absorbed the succulent flavours of the garlic herb butter. The slices of baguette were the perfect vehicle for dipping into that heavenly butter. 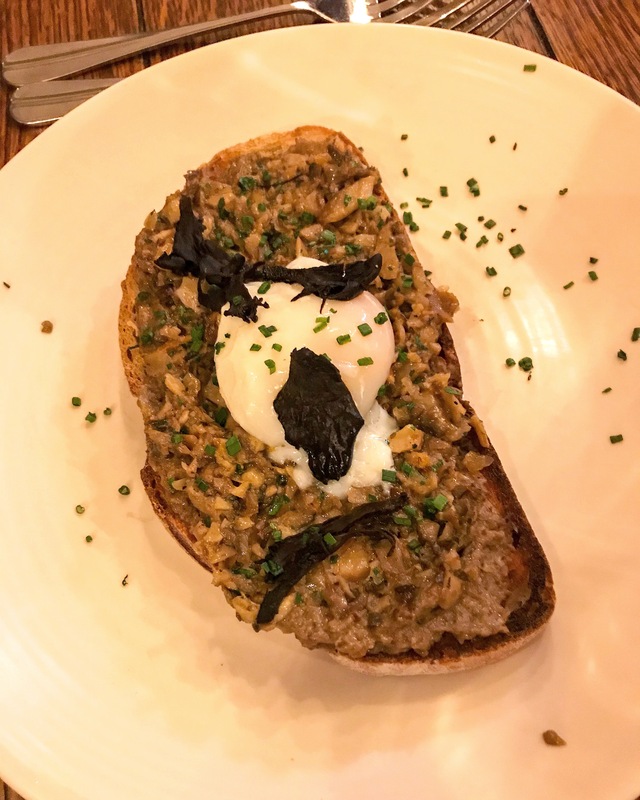 Wild mushrooms on toasted sourdough, topped with a poached free-range egg. 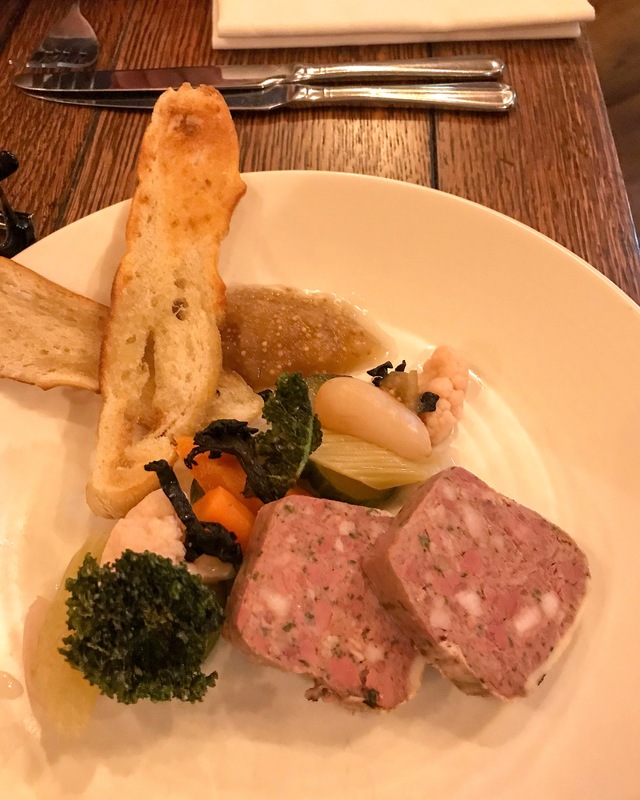 Traditional country terrine, a coarse pork & chicken liver pâté served with pear & apple chutney, pickled vegetables, kale crisps and toasted baguette. We got an extra starter for the table to share as I heard great things about the soufflés. 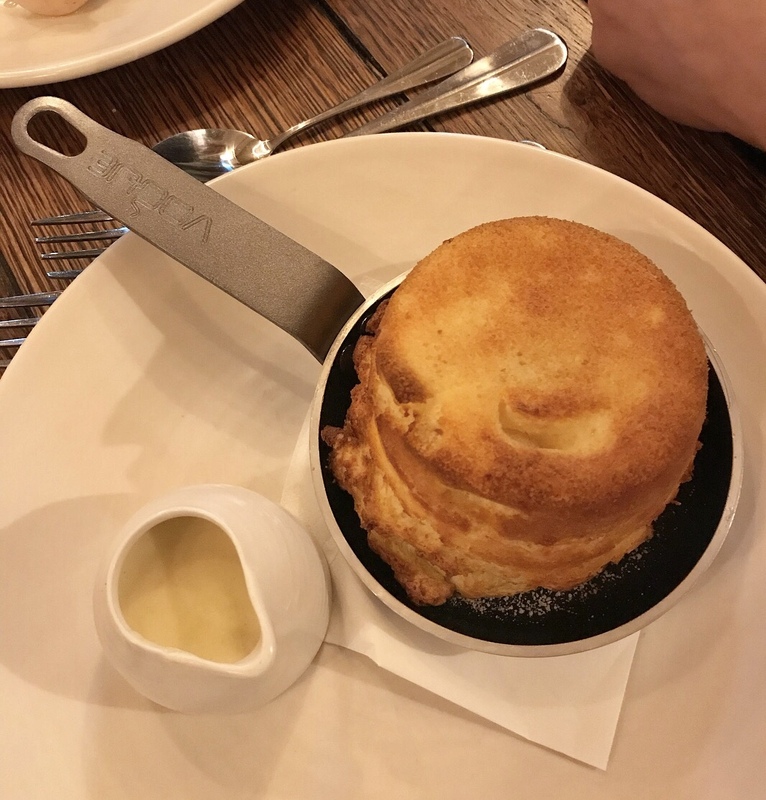 The fluffy cheese soufflé was perfectly executed. Served with a little pitcher of warm Ford Farm Coastal Cheddar sauce, this starter was both light and decadent. My main course of slow-cooked shoulder and leg of roast suckling pig, drizzled with rich pan juices, was tender and flavourful. 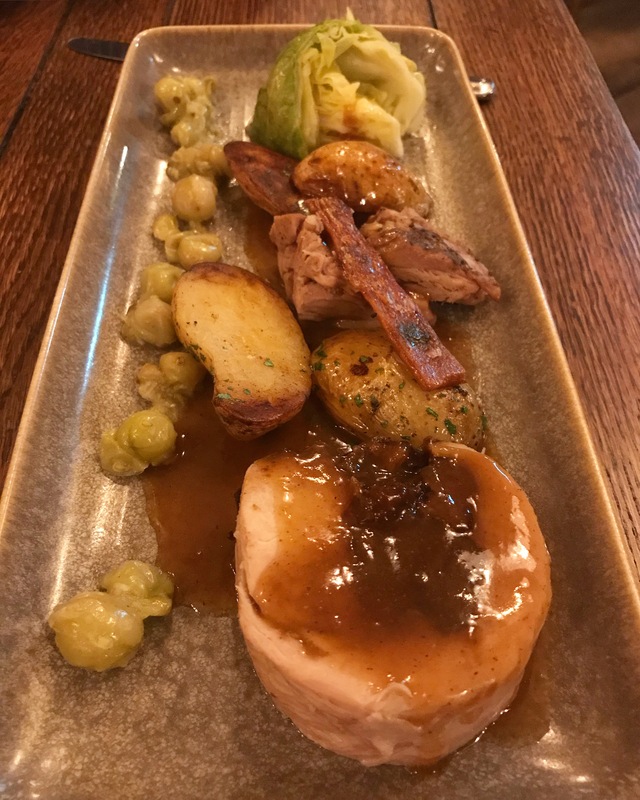 The dish was a work of art with beautifully arranged prune stuffing, caramelised crisp, hispi cabbage, sautéed potatoes and gooseberry compote. This may sound like a lot of food but I think one of their tantalising side orders would have made the dish more substantial. Next time I’m ordering the dauphinoise potato, one of my favourites. 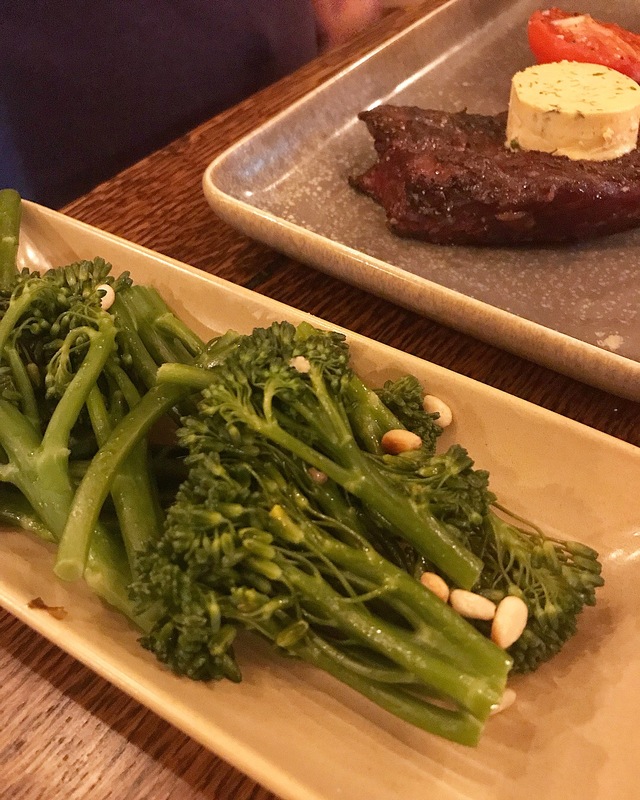 Paulo had the right idea with two side orders for his steak: a requisite bowl of chips and tenderstem broccoli with toasted pine nuts. Paulo chose the onglet with Café de Paris herb & mustard butter from The Boot’s impressive steak menu. Their beef is sourced from prime, pasture-reared Cornish cattle and these breeds are chosen for their flavour and tenderness. All of their chargrilled steaks are from 30-day dry-aged beef. 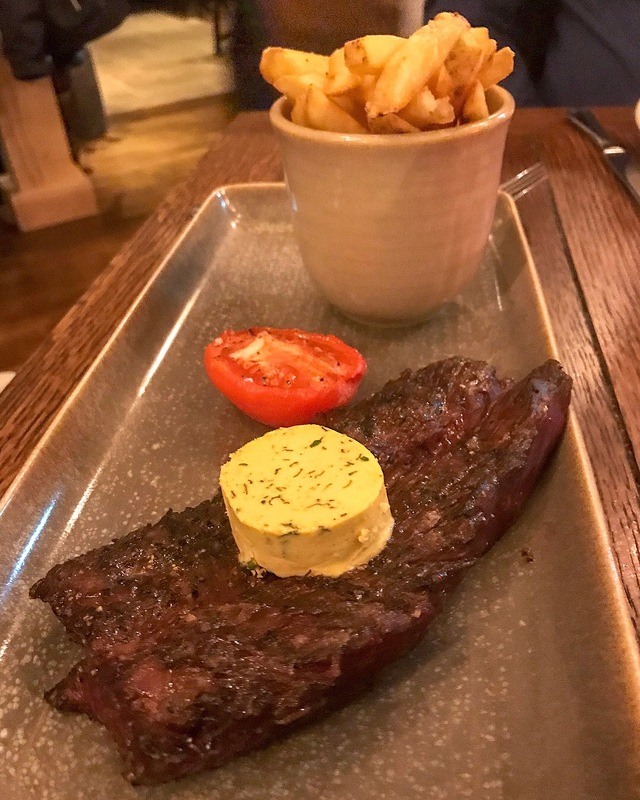 The onglet, also known as hanger steak because this flat cut of beef hangs beneath the diaphragm of the animal near the flank, is not very well known here but it was flavoursome and cooked to perfection (medium, like Paulo asked). 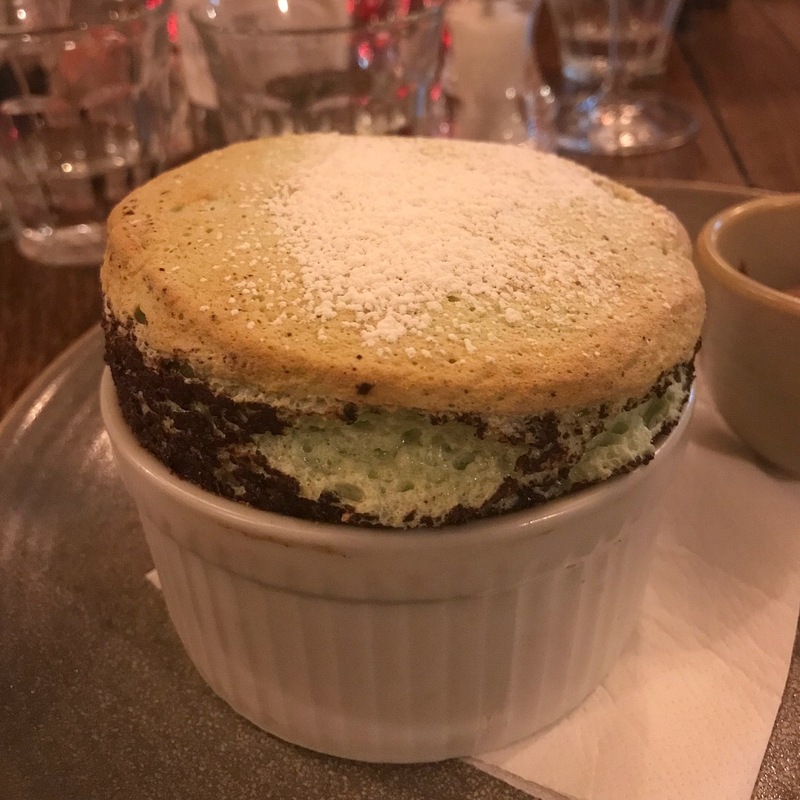 More soufflés for me, this time as dessert. 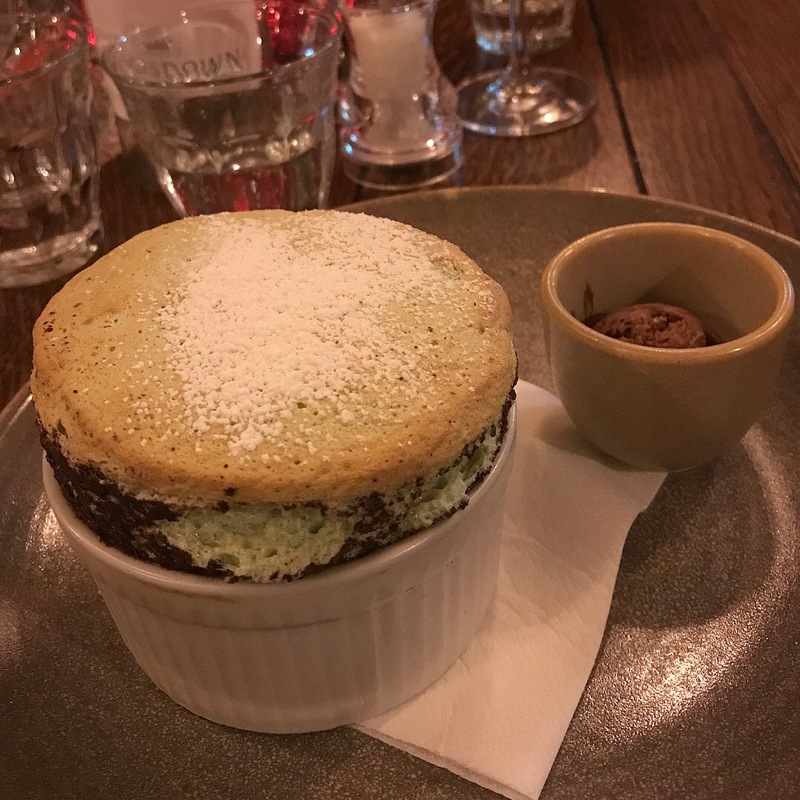 The light chocolatey pistachio soufflé was served with rich chocolate ice cream. A real winner! 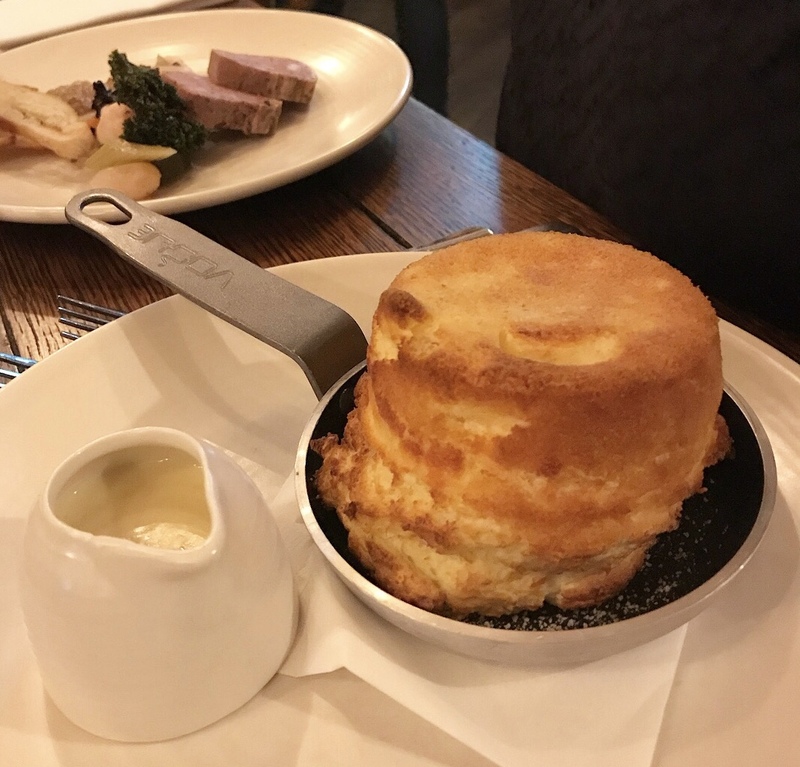 It’s worth going to The Boot just for their soufflés alone. 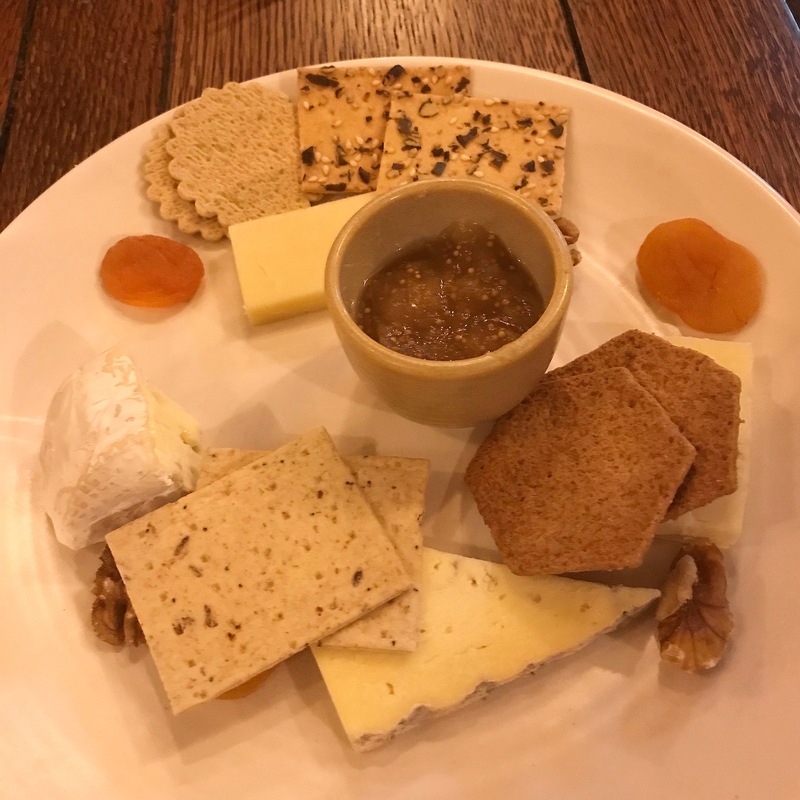 However, their cheese plate was phenomenal too and featured a varied selection to please the palate: Boy Laity Cornish Camembert, Lyburn Gold, Cheviot and Brighton Blue. Accompaniments included homemade chutney, dried fruit, nuts and a good amount of assorted crackers. The latter is important because there’s nothing worse than running out of crackers for your cheese. 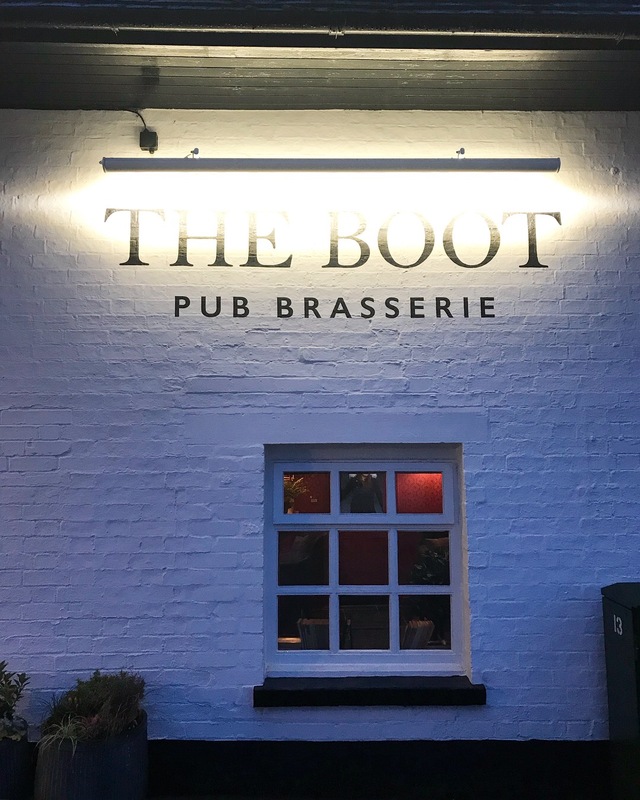 The Boot has it all. 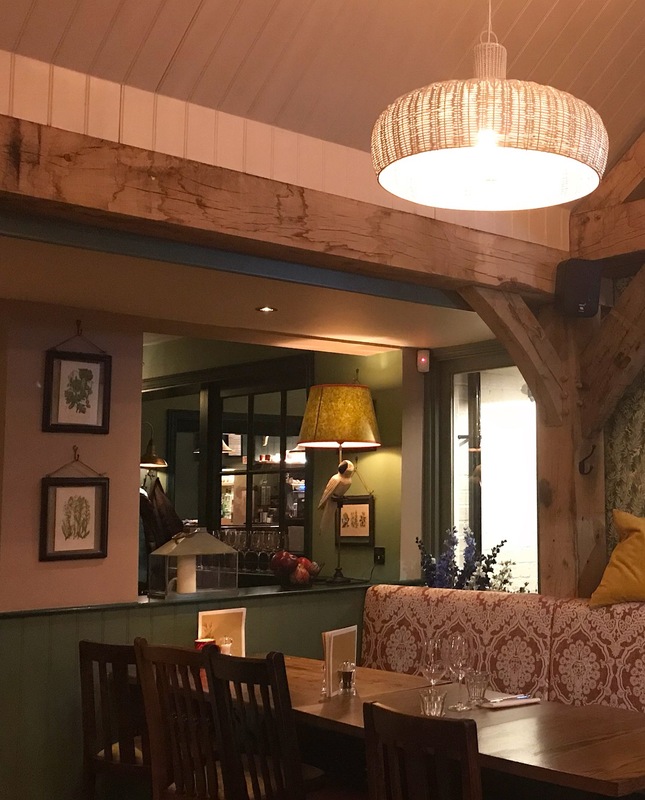 It’s a great pub and a top brasserie with good food and drink. It’s family friendly too with a really cute kids menu. I also have to give props to the staff. From the moment we walked in to the time we reluctantly left, service was helpful, friendly and efficient. 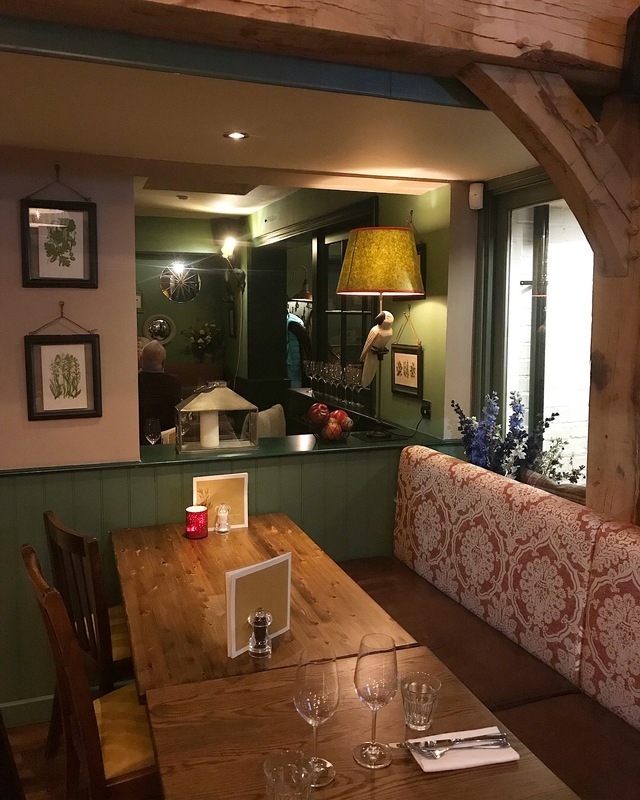 There’s a really great team in place and it was evident in the wonderful food and service we experienced. 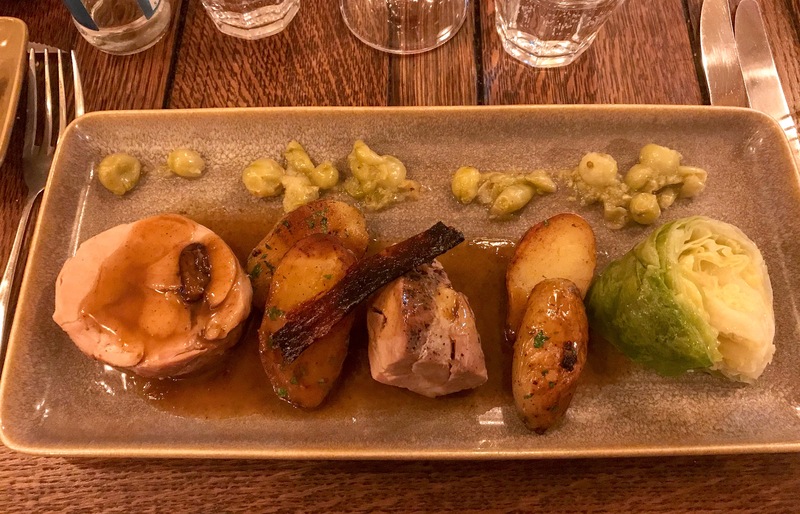 This entry was posted in Restaurants and tagged Cambridgeshire, cheese soufflé, escargots a la bourguignonne, hanger steak, Histon, onglet, pistachio soufflé, Raymond Blanc, snails, soufflé, suckling pig, terrine, The Boot, The Boot Histon, The Boot pub brasserie, White Brasserie Company by One Two Culinary Stew. Bookmark the permalink. Wonderful piece of writing, as per usual! I want to go back and try some more.